Beat eggs and lemon juice in a bowl; stir in Parmesan cheese and bread crumbs to make a paste. Fold in tuna and onions until well-mixed. Season with black pepper. 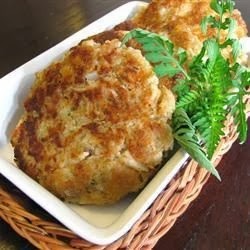 Shape tuna mixture into eight 1-inch-thick patties. Heat vegetable oil in a skillet over medium heat; fry patties until golden brown, about 5 minutes per side.